The house is a mess. The garden is the salvation. We were really reveling in the lack of mosquitos until yesterday. Oops. Well, what did we expect? It IS Minnesota. And for whatever reason we had a whole month of the No-Fly Zone. So that’s a good thing. And it will NOT stop us from enjoying the garden. In fact, there were new surprise arrivals this week along with the mosquitos. 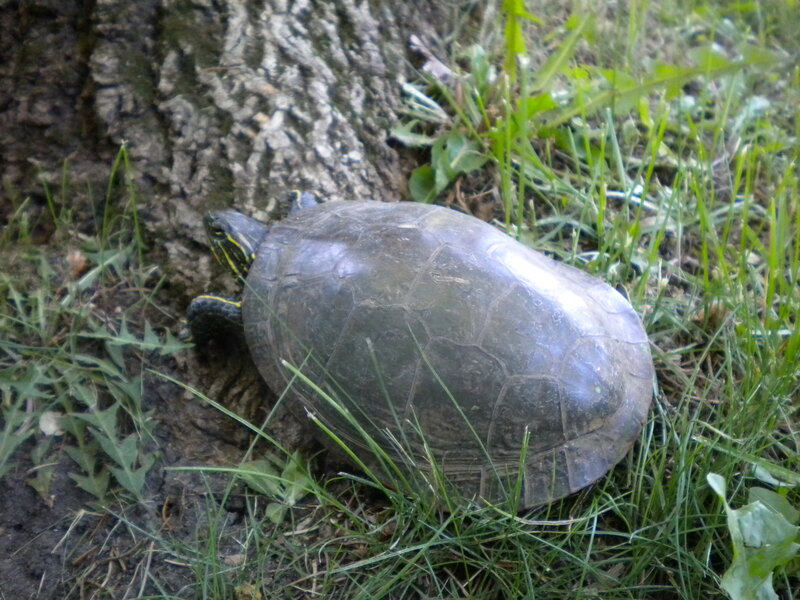 The first was a turtle which Robert (who incidently wants to be called and will hence forth be referred to as BOB in Minnesota) almost stepped on in the driveway and turned out to be a Painted Turtle – most common to this very watery part of the state and I suspect he/she might have been hibernating in our small pond and was now awake in the spring and off to find a nice sandy spot to bury eggs. Or so I am told by Wikipedia. So it was most likely a “she”. I did pick her up in spite of a great deal of fuss on her part and re-position her for her blog entry. My cousin Curt told me later that they are notorious for inflicking nasty bites, but no harm done and she scuttled away under the hedge after her brief photo shoot. 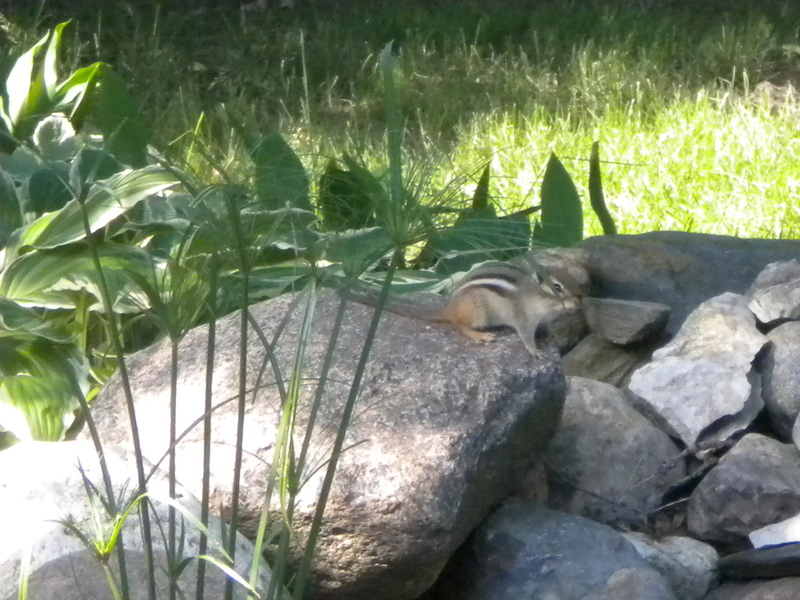 Our second surprise resident/visitor turned out to be a chipmunk. I was enchanted and we ooh-ed and ah-ed over its cuteness (think Alvin) until Maryanne told me about the plant destruction possibilities and how she trapped and transplanted chipmunks in the way we redistributed the grey squirrels in California. In fact she (of the scissor cutting alfalfa pellets story for rose cocktail) even had her husband (who cut up the pellets too!) paint each chipmunk’s tail blue so she could be sure they were transported far, far away and were not returning to ruin another day. 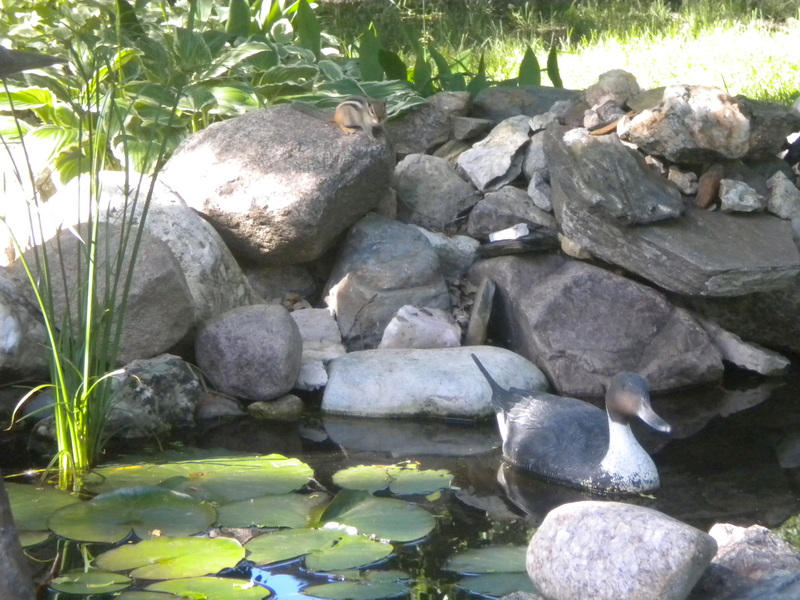 And by the way, for anyone living now in Plymouth, Minnesota, if you happen to see what you think is a new and exciting species of chipmunk, think again – it’s just Maryanne’s paint. Therefore our resident chipmunk was a short lived thrill and now I’m running out to my herb and tomato patch many times a day. So far – okay. But here’s the real thrill. 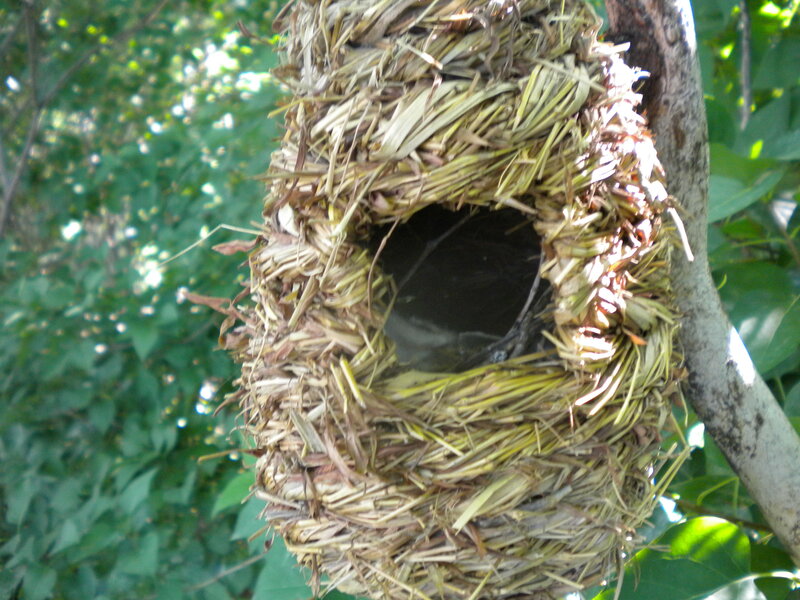 The lovely wren pair actually signed, sealed and delivered on the house. Today I went again and stood on a chair and peeked inside and actually saw TWO gaping open mouths. 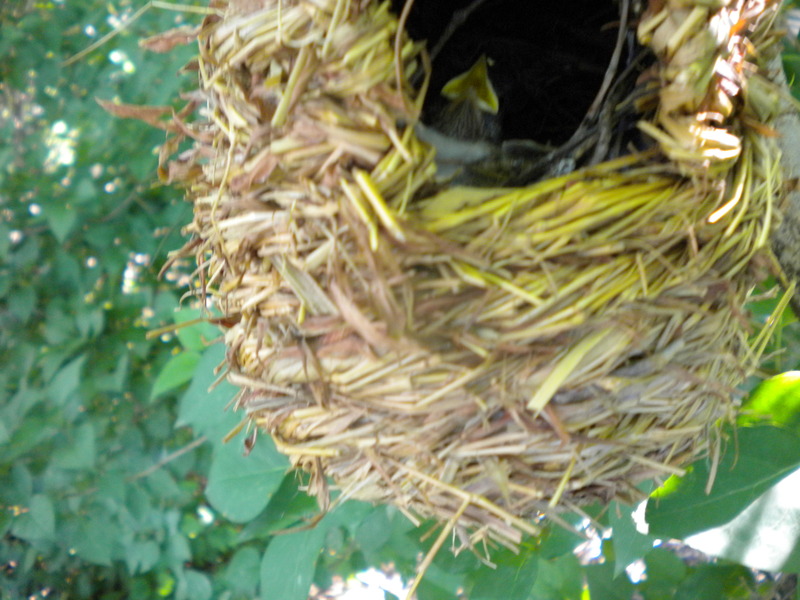 I managed to capture a picture (barely visible) of one of the chicks before the parents made a huge ruckus. All’s good in the garden. Happy Fourth of July! 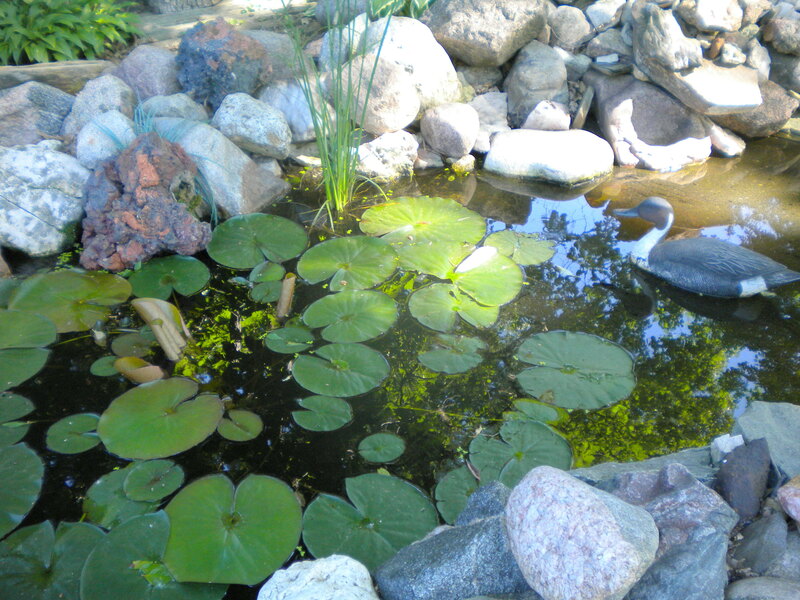 There was no way you would get by a whole summer with out the pesky mosquito in Minnesota. That is the culprit that dug out all my newly planted pots each spring, you have pictured! 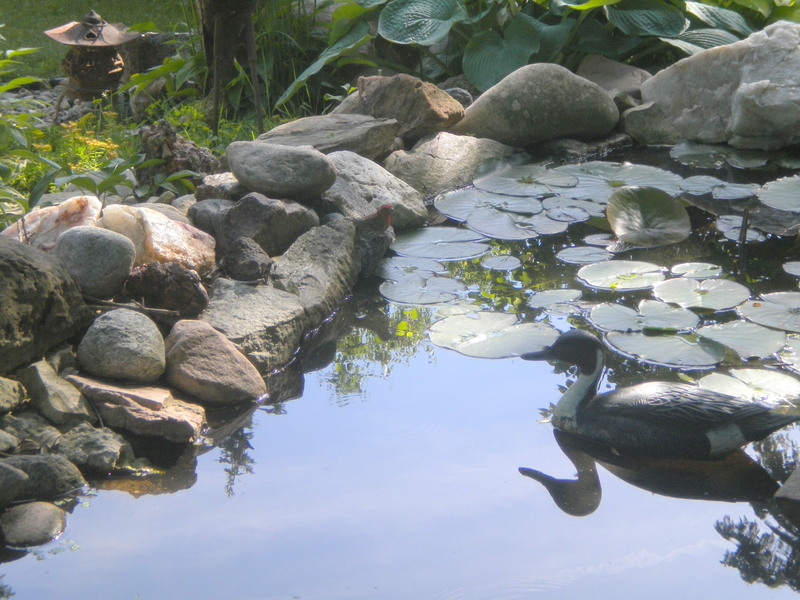 Your pond is absolutely beautiful. Hopefully you will get accustom to all of this,which is Minnesota. 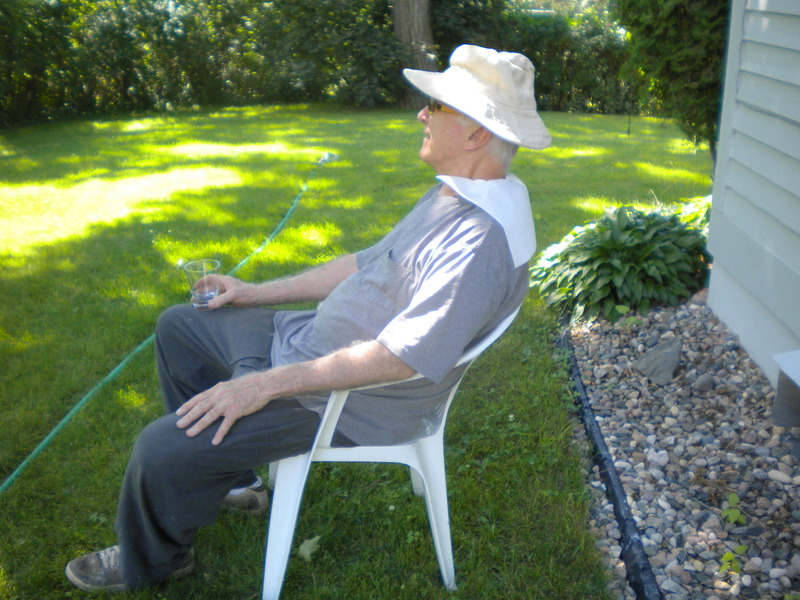 i loved the picture of Robert ,now known as Bob since moving to Minnesota! I enjoyed this post, with great pictures. Keep on posting, I will keep on enjoying! !